I can't make it to the race! Can I still get my race shirt and/or medal? We’re happy to mail your shirt. Please email info@laceuprunningseries.com at least one week before race day with your name, mailing address, gender, and shirt size. You’ll have to cover the cost of shipping. We do not ship race medals. If you have signed up for a race but would like to change your distance, you can easily do that. Just locate your confirmation email and follow the instructions. Can I refund my entry? LaceUp adheres to standard race industry policy. Race entries are NON-REFUNDABLE unless participants have purchased the $8.00 refund insurance during registration. Participants can request a %100 refund of their registration fee, including processing fees, if they are unable to attend due to covered reasons such as injury, illness, pregnancy and unexpected travel delays. If no insurance is purchased, no refunds will be given. Note, race insurance is handled by a third party and refunds are processed through third party and not through LaceUp. Refer to email provided by insurance company to process the request. Are the race venues ADA accessible? Yes, but please contact info@laceuprunningseries.com for specific details. Strollers are allowed at all LaceUp events. Runners with strollers will be asked to start at the back of their respective wave. How do I earn a challenge medal? All LaceUp runners must complete a race of any distance all four locations. In addition to individual location medals, each challenge runner will receive a limited edition LaceUp Running Series Challenge medal after the completion of all four races. Learn more about the challenge medal. Do I get a discount for registering for multiple LaceUp races? Yes! Register for your second race at 10% off, third race at 15% off, and your fourth race at 20% off. Discounts are automatically applied, and you must register for additional LaceUp events in one transaction to receive the discount. Yes, there will be pacers for each half marathon and marathon. Please refer to each race location for pacing times. How do I become a Lexus LaceUp pacer? Please contact Vanessa Kline at info@beastpacing.com if you’re interested in being a pacer. Results will be available at the Lexus space in the Health and Fitness expo area. In addition, results will also be posted online on the Laceup Running Series Website. Will there be aid stations on course? There will be aid stations approximately every two miles on each course and at the finish line. Aid stations will be stocked with Nuun and Honey Stinger product. What is the time limit on the course? There is a four-hour time limit on the Half Marathon courses. Participants need to maintain a 18:20 minute/mile pace. 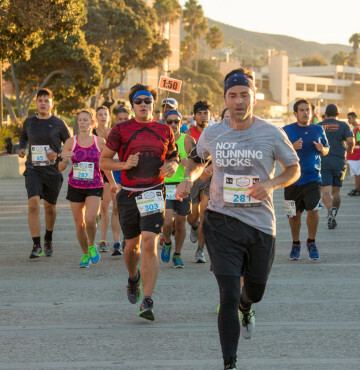 Ventura marathon time limit is six hours. Participants that fall behind the time limit will be directed to the sidewalk by course staff or police officers. Participants will be allowed to finish the race but will not be guaranteed a finishing time. It’s highly recommended that athletes stop by our pre-race packet pick up, but packet pick up will be available on race day. Race day packet pick-up will be free for those that register more than 30 days before each race. If you register for a race within 30 days you must purchase race day packet pick-up with your registration for an additional $5. Come early, because packet pick up will close 30 minutes before each race. If you cannot complete the course there will be a vehicle available to bring you back to the finish line, so you can enjoy the Health and Fitness Expo and post-race brunch. Where can I check my gear during the event? There is a secure Gear Check available for all participants. You can drop off your items before the race and pick them up after the event. Entry fees can be transferred to another participant in the same race of the same calendar year. Any difference of fees will be charged, plus a $10 processing fee. Entries can also be transferred to another LaceUp Running Series location, during the same calendar year. If transferring to another location, a request must be made three days before the event the participant was originally registered. Age group categories are 9 and under; 10-14; 15-19; 20-24; 25-29; 30-34; 35-39; 40-44; 45-49; 50-54; 55-59; 60-64; 65-69; 70-74, 75-79, 80-84, 85+. Age group prizes will be awarded to the top 3 finishers in each age group. If an age group category above 85 has 5 or more participants, an age group prize will be awarded. Overall winners will not qualify for age group prizes. Prizes can be picked up at the Awards Podium at the race. If you forgot to pick up your age group award on-site, email info@laceuprunningseries.com. Age group awards will be shipped for the cost of shipping. Participants must be eight years or older to participate. Participants under the age of eight will be allowed on a case-by-case basis. Please email if interested. Can I run a different distance than I am registered for? Participants can transfer distances. Participants transferring to a longer distance will be charged the applicable difference in registration fees, and participants transferring to a shorter distance will not be offered a refund. Please email if interested in changing your race distance. 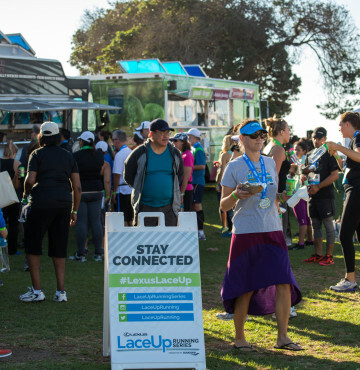 Every participant will receive a LaceUp t-shirt, reusable race bag, high-quality finisher’s medal, timing chip, bib, food truck brunch, Sierra Nevada beer and free race photo. Learn more about racer perks, HERE. Do you offer an elite athlete program? Yes. Learn more about our elite athlete program here. Are bikes, skateboards, inline skates, dogs or skateboards allowed? For safety reasons, no bikes, skateboards, inline skates, dogs, or skateboards will be allowed on course. Can I use headphones during the race? For safety reasons, we don’t recommend wearing headphones during the race. If runners choose to wear headphones during a race, we request they use a low volume enabling them to hear runners and traffic around them. How do I become a Lexus LaceUp Running Series brand ambassador? Thank you to all that have applied to be a 2018 LaceUp ambassador. The ambassador application is now closed.